Java runtime environment from Oracle. Is there a better alternative to Java SE Runtime Environment 9? Is Java SE Runtime Environment 9 really the best app in Java category? 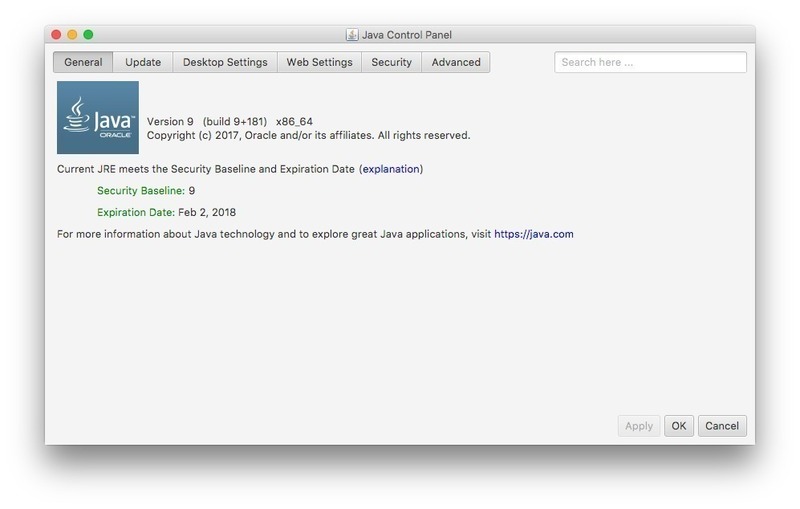 Will Java SE Runtime Environment 9 work good on macOS 10.13.4? Java SE Runtime Environment 9 was an update to the Java Platform. This release included much awaited new features like the modularization of the Java Platform, better performance, support for new standards, and many other improvements. security-libs/javax.net.ssl - Negotiated Finite Field Diffie-Hellman Ephemeral Parameters for TLS -- The JDK SunJSSE implementation now supports the TLS FFDHE mechanisms defined in RFC 7919. If a server cannot process the supported_groups TLS extension or the named groups in the extension, applications can either customize the supported group names with jdk.tls.namedGroups, or turn off the FFDHE mechanisms by setting the System Property jsse.enableFFDHEExtension to false. other-libs/corba - Add additional IDL stub type checks to org.omg.CORBA.ORBstring_to_object method -- Applications that either explicitly or implicitly call org.omg.CORBA.ORB.string_to_object, and wish to ensure the integrity of the IDL stub type involved in the ORB::string_to_object call flow, should specify additional IDL stub type checking. This is an "opt in" feature and is not enabled by default. If the com.sun.CORBA.ORBIorTypeCheckRegistryFilter property is not set, the type checking is only performed against a set of class names of the IDL interface types corresponding to the built-in IDL stub classes. security-libs/javax.crypto - RSA public key validation -- In 9.0.4, the RSA implementation in the SunRsaSign provider will reject any RSA public key that has an exponent that is not in the valid range as defined by PKCS#1 version 2.2. This change will affect JSSE connections as well as applications built on JCE. security-libs/javax.crypto - Provider default key size is updated -- This change updates the JDK providers to use 2048 bits as the default key size for DSA instead of 1024 bits when applications have not explicitly initialized the java.security.KeyPairGenerator and java.security.AlgorithmParameterGenerator objects with a key size. If compatibility issues arise, existing applications can set the system property jdk.security.defaultKeySize introduced in JDK-8181048 with the algorithm and its desired default key size. security-libs/javax.crypto - Stricter key generation -- The generateSecret(String) method has been mostly disabled in the javax.crypto.KeyAgreement services of the SUN and SunPKCS11 providers. Invoking this method for these providers will result in a NoSuchAlgorithmException for most algorithm string arguments. The previous behavior of this method can be re-enabled by setting the value of the jdk.crypto.KeyAgreement.legacyKDF system property to true (case insensitive). Re-enabling this method by setting this system property is not recommended. security-libs/javax.net.ssl - Disable exportable cipher suites -- To improve the strength of SSL/TLS connections, exportable cipher suites have been disabled in SSL/TLS connections in the JDK by the jdk.tls.disabledAlgorithms Security Property. core-svc/javax.management - JMX Connections need deserialization filters -- New public attributes, RMIConnectorServer.CREDENTIALS_FILTER_PATTERN and RMIConnectorServer.SERIAL_FILTER_PATTERN have been added to RMIConnectorServer.java. With these new attributes, users can specify the deserialization filter pattern strings to be used while making a RMIServer.newClient() remote call and while sending deserializing parameters over RMI to server respectively. The user can also provide a filter pattern string to the default agent via management.properties. As a result, a new attribute is added to management.properties. Existing attribute RMIConnectorServer.CREDENTIAL_TYPES is superseded by RMIConnectorServer.CREDENTIALS_FILTER_PATTERN and has been removed.